This potent, great tasting and easy to use drink is formulated to cleanse and detoxify men and women just like you. 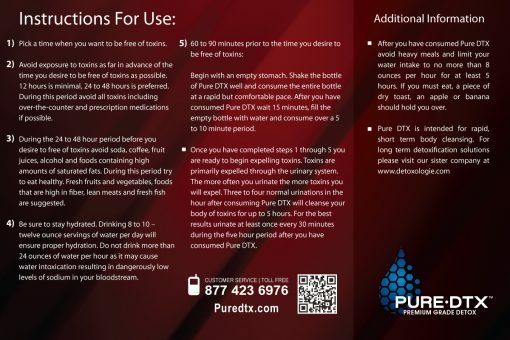 For over 25 years millions of satisfied customers have enjoyed the peace of mind that comes with using our ready to drink formulas for people with immediate cleansing needs. Pure Detox Extra Strength is suggested for people with moderate to high toxin levels and for people weighing up to 240 pounds. Scroll down the page for full details on our extra strength detox drinks. Drink the entire contents of the bottle. Wait 15 minutes, fill the bottle with water and drink at a comfortable yet consistent pace. Pure Detox starts to work immediately. Your cleansing and detoxification process has begun! Be sure to urinate frequently. 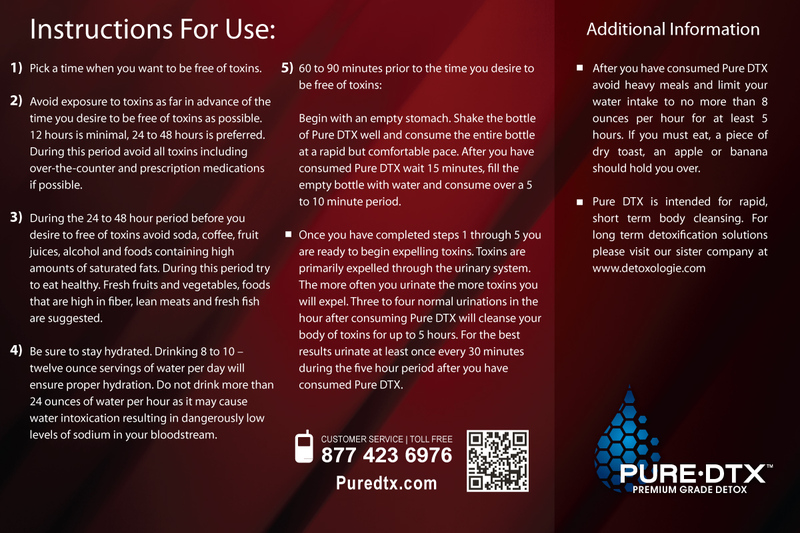 3 or 4 normal urination’s after consuming are required to eliminate toxins. 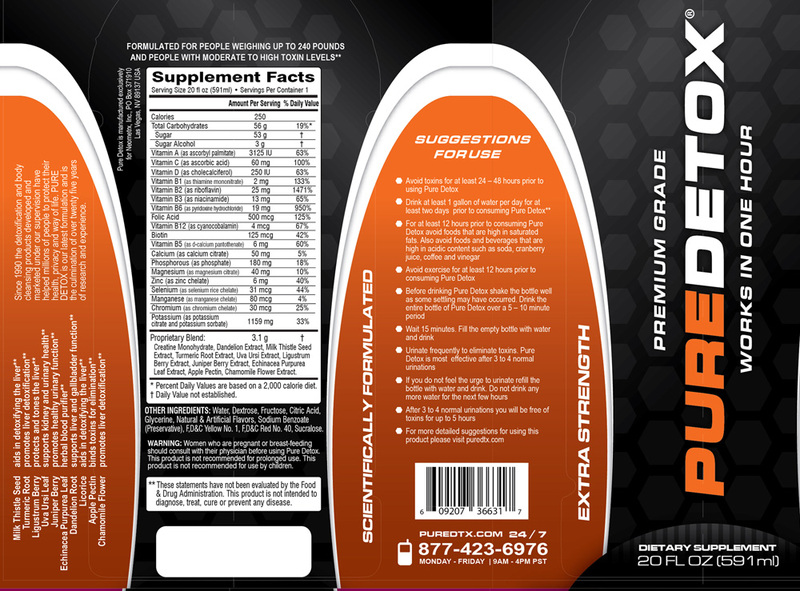 The beneficial results of this product should last for up to 6 hours. In the two or three days prior to using Pure Detox try to drink about 1 gallon of water or green tea per day. Avoid taking OTC drugs, large quantities of vitamins or acidic liquids such as coffee, vinegar and fruit juices. 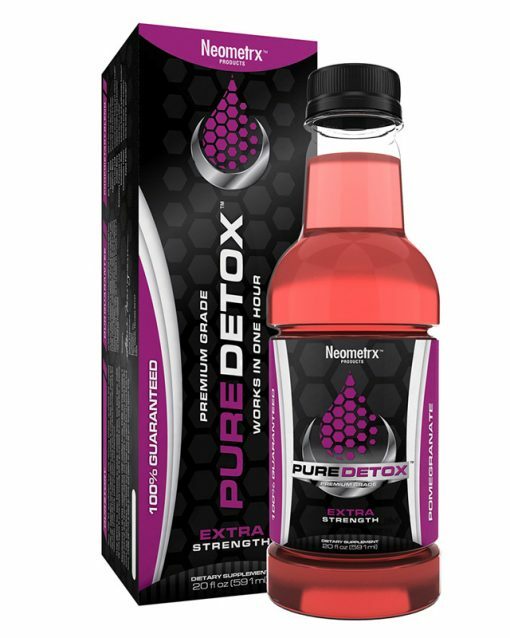 Avoid nicotine and caffeine and other unwanted toxins prior to use of this product. Do not eat large meals before using the product. Once you’ve completed these easy steps simply relax…you have purchased the best cleansing product on the market. Our formulations and products have been used for over 25 years by millions of people who are serious about cleansing and detoxification. Milk Thistle Seed – rejuvenates and protects the liver, stimulates the production of new liver cells, protects the kidneys and boosts the immune system. Dandelion Root – cleanses the blood, stimulates bile production, reduces cholesterol and uric acid. Improves liver, gallbladder and kidney function. Uva Ursi – improves liver function, diuretic. Apple Pectin – binds to toxins for quick elimination from the body, aids in Reducing serum cholesterol levels.